About a month ago, I entered myself into a drawing to be one of a bunch of mommy bloggers chosen to host a Nutella Party, much like my POM Wonderful dinner a few months back. I was one of the lucky ladies chosen and MommyParties and Nutella sent me a box of goodies to hold a nice little breakfast party. I was supposed to host the party by the 21st, but since I only got my box of materials on the 18th, they let me have an extension, which I really appreciate because I couldn’t get anyone to come so last minute! I was busy cleaning the house, so I got Baby Girl to get all the party bags ready, which she loved doing. Each gift bag came with recipe cards, a coupon, a Nutella sample, a Nutella spreader, and a Nutella coffee mug. I told her to make the bag look full, as the cup with papers looked a bit empty in one half of the bag. I was quite proud of her for figuring out that she could lay the box for the cup down flat. 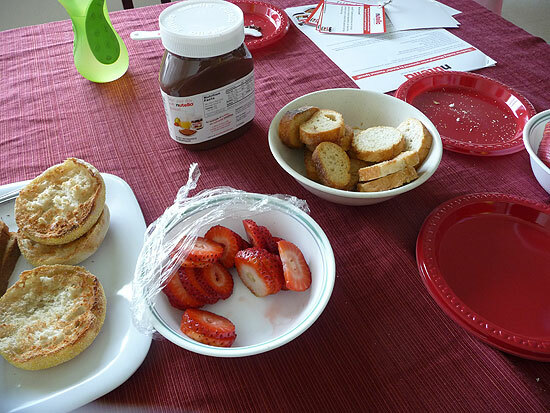 For our breakfast, I bought Roman Meal Honey Oat bread, whole wheat tortillas, English muffins, cinnamon toasties, strawberries, and a gala apple. I had invited a bunch of my cousins to the party and since my family hasn’t seen them in a while, I told them they were more than welcome to bring their kids. My cousins all went on a baby booming spree a couple years after I had Baby Girl, so we had a house full of little kids. 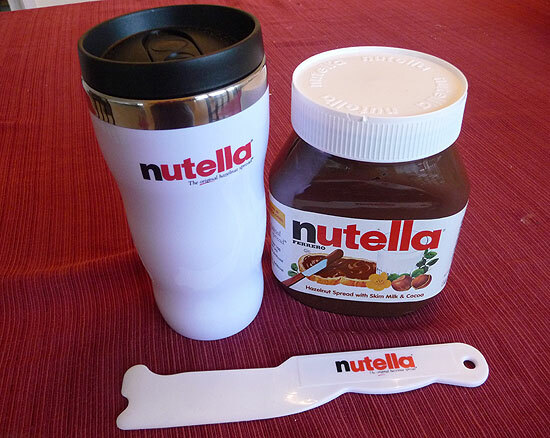 Here’s the coffee mug, along with the jar of Nutella they sent me with some funky looking spreaders. We tried to figure out what the oddly shaped end was for, but all one of my cousins could come up with was that it looked like a heeled boot. LOL! 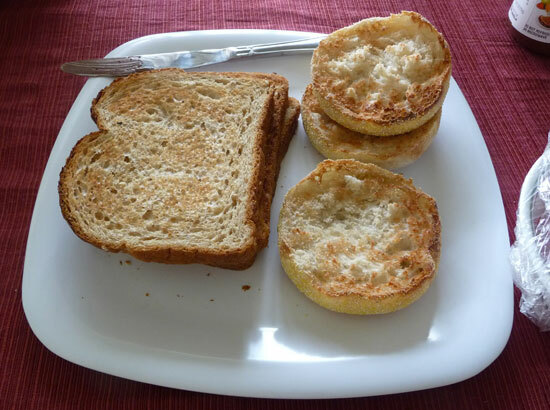 My toaster oven is broken, so I had to broil these in the oven, flipping the toast over once. The kids were more interested in the fruits, so us moms ate the bread and nutella. 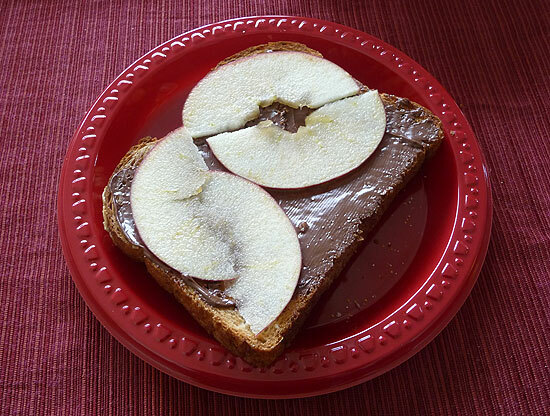 Here’s a slice of toast that I tried with Nutella and apples. It was okay. I preferred the strawberry topping instead. 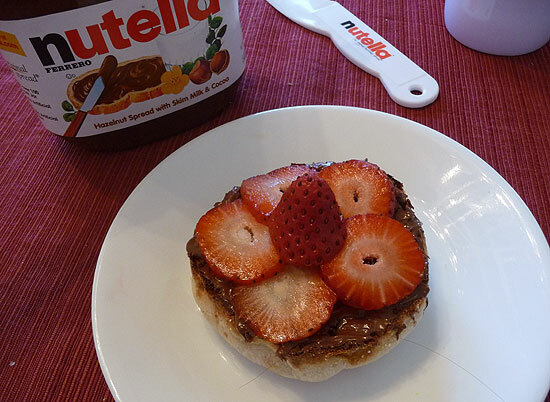 Here’s an English muffin with sliced strawberries. And oh my freaking god there’s a hair on it!! I sure hope I removed it before eating. (and that it was mine…) This is really good. I actually ate this for breakfast again this morning. Baby Girl can’t eat Nutella because she has a nut allergy, but she loved the cinnamon toasties. She left one untouched on her plate so I snagged it to eat. I meant to take more photos, but it was pretty chaotic with so many munchkins running around that I ended up missing most of my photo opportunities. My cousins had all seen Nutella in Costco before, but since they hadn’t tried it before, weren’t really into the idea of buying two 26 oz jars at once. It was a great way for them to taste it without taking the risk of not liking it. 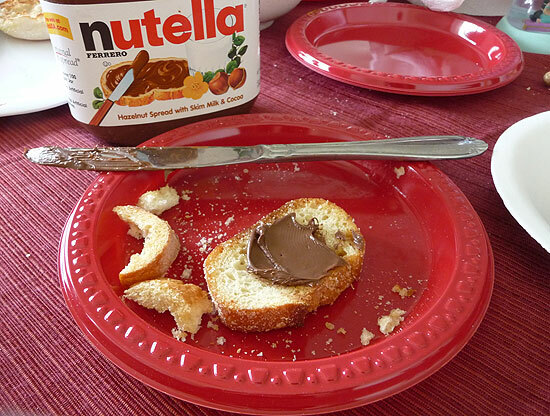 Nutella basically tastes like a sweet melted chocolate and so it goes without saying that they all really enjoyed it. After we stuffed ourselves with tons of carbs, we went outside to play with the kids. Baby M had just learned to walk and she totally loved Max. Baby Girl kept touching her on the top of her head because her hair was so soft. Baby C godzillaed into my carrot bed, but fortunately only stomped on one. The older kids ran around yelling like kids tend to do. 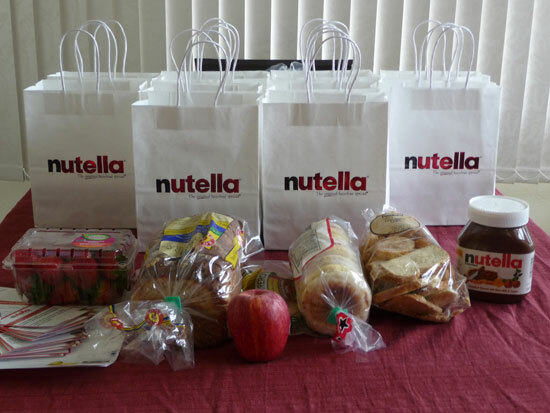 All in all a great day and I’d like to thank Nutella for sending us the fun gift bags and Nutella samplers.